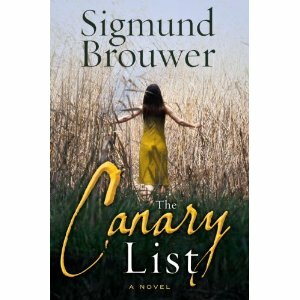 "The Canary List", by Sigmund Brouwer is a supernatural type suspense, which brings the Catholic church into the mix. Bet you weren't expecting me to say that! While struggling with the events of his past, a teacher finds himself thrown into a battle between good and evil, when one of his students seeks help from him. As a result of Jaime coming to him for help, Crockett Grey's life spirals out of control with a fire, jail, abuse, kidnapping, demons, and more. While, at a couple points in the book, I got a bit confused about which side some of the characters were on, the story moved along at a pace, which held my interest. I do wish there could have been some more 'depth' to some of the characters and their relationships. Just when I would start to feel something for one of the characters (which is important for me when reading a book), the description or the interaction would be cut short and the story would jump to somewhere else. The end of the story also left me a bit miffed. It was kind of like, "O.K. That's it then, I guess." I guess I was looking for a little bit more closure or follow-up, but I already admitted that I'm a sucker for feeling for a character. So, I guess I wanted to know what was next. This was the first book I've ever read by this author, and while I didn't immediately order another of his books, I would read another book by him if given the chance.